FAST N FOXI (Jewel) was born at 9:21 PM CDT on Tuesday April 22, 2008. 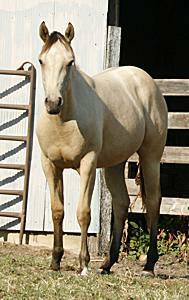 Her buckskin solid color was no surprise at all and she is also eligible for registration with American Buckskin Registry and International Buckskin Horse Assoc. 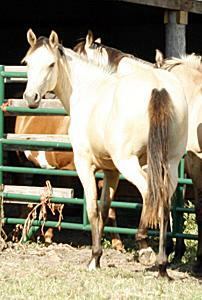 Her name comes from the fact that she likes to go fast, very fast, out in the pasture when she is playing with Bogo. Jewel has suffered horribly (as you can plainly see) from neglect this year as my house has been built and the barns repaired following the tornado in 2008. She is gentle, friendly and has ben a tremendous help as I've put my barn and pens back together so that I can get working with her and the other yearlings.